Heather, Camden, and I decided to take a road trip to see a Braves game today and no such road trip would be complete without planning it around at least one BBQ stop. Previously, we were going to take a road trip to hit up Carolina BBQ, Jackie Hites, and Belly’s all in one day. Unfortunately, the untimely death of a good friend of our 19-year old son Christian and the sudden opportunity for a close friend to receive a new liver, coupled with life in general, held us off of that trip and has slowed us down in making these trips lately. Anyway, we checked our route to Atlanta and saw that Belly’s and Hite’s were not far off our path. Having only time for one stop, we decided on Hite’s. We had seen a video of Hite’s and knew Jackie cooked whole hogs over wood coals. 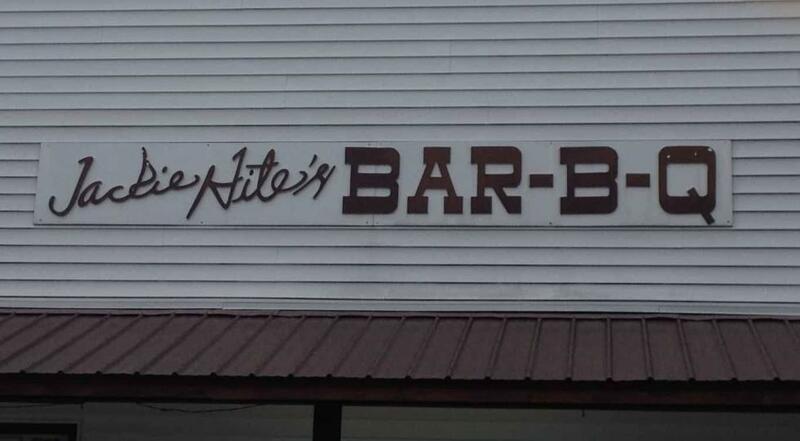 Having not had any exceptional BBQ lately, we figured this gave us a good shot, so we settled on Hite’s in Batesburg. Arriving right around lunch time, we pulled into a parking spot under some trees at the back of the building and could see the flames of Jackie’s “burn barrel” prepping the coals to go in his pits. Great sign. One of the simple truths we’ve learned along the way is that exceptional BBQ begins with wood coals. We entered and were invited to the buffet right away. That was an interesting twist; you pay after you have eaten, on the way out. The buffet was not extensive, but not lacking either. Hite’s is a good buffet with ample choice: fried chicken, hash and rice, coleslaw, collards, salad, corn, mac and cheese, field peas, and more. As you may know by now, our primary focus is finding exceptional BBQ, the rest is window dressing. “As for the BBQ?” I asked. “Meh..” I agreed. “I didn’t really like it. It was so mustardy… it was like straight mustard,” I continued. Unfortunately, Hite’s BBQ was a disappointment for us. The pork is pulled and wood cooked, but served pre-sauced, which we have found generally to be a mistake. It tends to make the BBQ mushy (Hite’s BBQ was not) and hides the flavor of the pork. Hite’s is, of course, a mustard-based BBQ. “You just have to like mustard-base, which I always thought I did,” I said, but apparently our travels this summer have cemented the notion that a good vinegar-pepper remains my favorite (though Ray’s was exceptional and not vinegar-based). We have yet to find a mustard-based BBQ that we consider among the elite BBQ’s that we have tried. Put it this way, we went to a BBQ place and Camden ate three pieces of fried chicken after having a single serving of BBQ. “It was great!” Camden said of the fried chicken. Indeed, it was moist and tasty Heather and I agreed. As for the sides, Hite’s delivered. “The vegetables seemed to be local produce, cooked southern style, not out of a can. That is what he has going for him,” Heather said. Indeed, the veggies were great. I loved the collards and had two servings. They were sweet and smokey and delicious. I didn’t get any smoked meat in mine, but I suspect it was there. I didn’t even add any vinegar to them (my general preference). The corn was amazing. It was like a creamed corn that reminded me of my grandmother’s, with a thick, milky base and delicious, crisp corn. Everyone really liked it, including Camden. Heather and I had a deep-fried, breadcrumb-coated squash that was quite good, firm and not greasy. While Heather said the field peas were not exceptional, they were good. The mac and cheese was also good, according to Camden. Heather enjoyed the green beans but wondered why she didn’t sense any smoked pork meat in it. The hash was different from any hash we have seen so far. It was a pale color, almost like a white gravy in color. Also, the texture was different in that most of the hash we’ve had has had finely ground meats, in a way similar in texture to good stone ground grits (though not as generally as thick). In these, I could see fine strings of pulled pork in the gravy-like sauce. It was ok, but we tend to prefer the tomato-based hashes we have tried. Neither of us had seconds. Overall, our meal was good. I guess we just don’t care for the mustard-based BBQ sauce that was too “mustardy” for us. “You know, he’s cooking a good product,” I commented afterward. I really just wish we could have tried the pork without the sauce being added ahead of time. In the end, was it worth the trip? We agreed that we wouldn’t drive from Mount Pleasant again just for the BBQ, the corn and collards, maybe, but not the BBQ. These were the only photos we got. My phone was dead when we arrived. Camden shot these from his phone before we left. Click below for a map of Jackie Hite’s location. View Jackie Hite’s BBQ in a larger map.